Wanna make all of Wall Street jealous in one email? 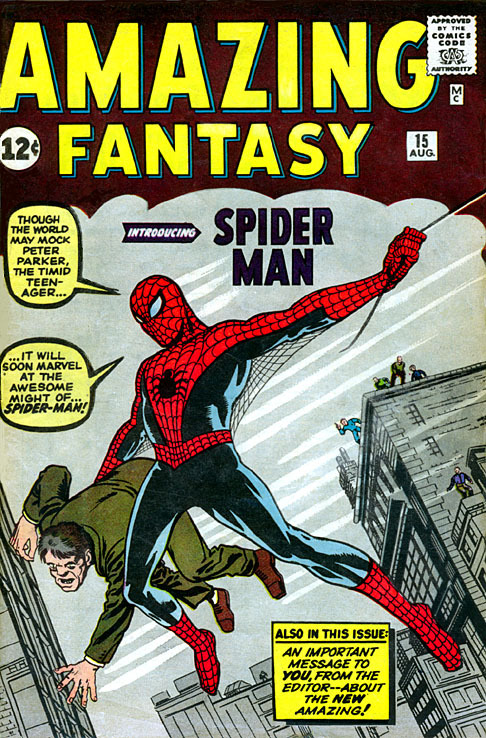 Tell them that Amazing Fantasy #15, a book that sold for a mere 15 cents in 1962 has just sold for $1.1 million to a private buyer. Try getting that kind of return on investment in a 'recession' with shares and stocks! While I always thought my once 'invaluable' WWF wrestling cards would be the ones to create my retirement lifestyle, the fact that a comic from the 60's can break a piggy bank of this size, means there might still be hope for my non-golden age comic book collection to come up to the mark (polybagged, wraparound cover, with Deadpool trading card, sealed-with-a-kiss X-Force #1 I'm looking at you - no pressure). You hang on to X-Force 1. You will be rich! Or your Great-Grand-children will. Oh why didn't our grandparents had the vision to keep some numbers well preserved somewhere? I'm sorry, I have always had a hard time believing Rob Liefeld's art will ever make anyone rich in perpetuity. But that might just be my personal artistic opinion. We can dream, can't we? I'm hoping my 3 boxes of Autobots and Decepticons (about 150 of them from all series of G1 from '86-'89) help to put my 3 animals through college some day or buy us our retirement home. Hell, Fortress Maximus was up to $6,000 last I checked. Random, I'm with you. His proportions always bugged the hell out of me. His pinhead Wolverine was the worst. Dan has been MIA for the past couple of days i hope he's alright. Me too. Mrs. D and I went out to dinner tonight but spent most of the time watching the CNN footage on the tv's there. If Hawaii got 7 ft. waves I've got to think NZ got hit pretty hard too. Good luck to you Dan. Hope you're okay. Thanks for the concern - I'm okay - back and should be on track from now on. Just had something come up last minute and while I tried to get in and post there just hasn't been enough hours in the day. While the seas churned we didnt get anything too damaging thankfully. As for Mr Liefeld, well... yes. While I'm not a fan myself, I'm always glad to see artists with an individual style. Maybe as the imitators die off he will get appreciated for at least having that. You live there? I need to relocate. One of these days I'll post up a picture of the Eden that is Waterville so you can compare and contrast. Thought about doing it today whilst standing in my driveway avoiding the 3 inch deep mud by stepping on the ice. How both can co-exist is part of the magic of Maine in Spring. We don't get snow down this close to the water so I've never had to handle that kind of ice. The skifeilds are two hours drive from here and I'll leave the crazy fools who try that out to experience the frost! Craig, are you in Spring already there? Dan snow is beautiful, even if I hate the cold. What a beatiful place you live. Aliera, spring is officially here this weekend, but it doesn't usually start warming up until April. We had a warm spell this week, enough to thaw the ground, melt about a foot and a half of snow, and make a mess. Hard case. Here Craig we are about to head into Autumn or as you folks call it Fall. The mornings are already getting cooler but daylight saving isn't far away so that will help with the early starts for a bit! Glad you liked the picture Aliera - this old place does polish up nice for the camera! Where abouts do you live?